maple bacon and beavertails: Banned. I have officially joined the never.owning.another.microwave.again club. This is microwave numero 2 that has died within the last 6 months, really??? My first wave of appliances that I was banned from was toaster ovens, after an uber embarrassing experience of catching my parents kitchen on fire, throwing water ON an electrical fire, and having the alarm system have the fire trucks show up at my house. 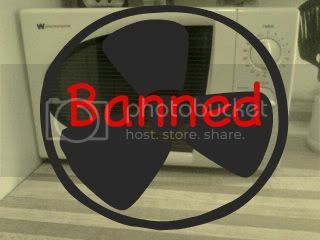 (Insert mortified look) I was banned from the ever owning a toaster oven club. I am telling you it's an appliance conspiracy and next my fridge will stop working and i'll have to start living off of the land. This is very funny. A little curious about the toaster oven too. Can't say I'm sorry you won't have another Microwave. Just think of all the tasty food you can make that won't be nuked. Thank you for stopping by my blog. Following you back from MBC. Very funny! I wish you better luck on your appliances. I'm your newest follower from MBC!